Guided Injections Have Never Been This Easy — Or This Beautiful. 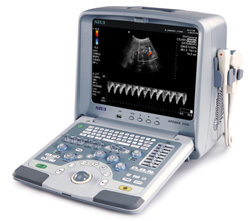 The New Apogee 1100 Orthopedic Ultrasound. Available second 15" LCD monitor installed on cart. High-Density Extreme Broadband 5-12 MHz Linear Probe. High-Density Deep-Penetrating 2.5-5.0 MHz Convex Probe. Call us now at 800-839-0722. We can answer all of your questions about adding ultrasound to your podiatry practice and help you make the best choice of a new ultrasound. Comparing Us With Other Podiatry Ultrasound Dealers? Training Session: Private phone session with an expert (about one and a half hours). NEW! Lifetime GOLD Membership to our new Ultrasound Training Resource Site. * Note: You may of course also simply purchase the ultrasound alone, without our complete orthopedic package, at a lower price. You have the option of either buying the ultrasound alone at one price, or buying the full package at a higher price, or even of picking and choosing among what you would like to add or take away. Just give us a call and we can tailor a package precisely to your needs. The Apogee 1100 Ultrasound from SIUI, equipped with the extreme-broadband linear 5 - 12 MHz probe (other ultrasounds only go up to 10 MHz) and the deeper-penetrating convex 2.5 - 5.0 MHz probe, is now our premiere portable ultrasound for musculoskeletal and orthopedic applications. An enormous 12" LCD display for the sharpest and easiest-to-see imaging. Not only a linear 5 - 12 MHz probe (giving you a broader range to work with than any other system), but also a convex 2.5 - 5.0 MHz probe, allowing you to acquire deeper imaging for more extensive guided injections and for working with obese patients. An even faster processor and larger hard drive and expanded focal range, for maximum performance. Full PW Color Doppler — enabling you to see blood flow in red and blue, allowing you (among other things) to distinguish between vessels and nerves, and opening up a wide range of vascular applications. The latest SRT "Speckle-Reduction" technology (so your images are sharper), a much more extensive zoom (so you can zoom in twice as much as before), and a wide range of additional image-enahncement features. Ultimately, for orthopedic work all you really need is the CTS-5500+ or the even nicer CTS-8800. 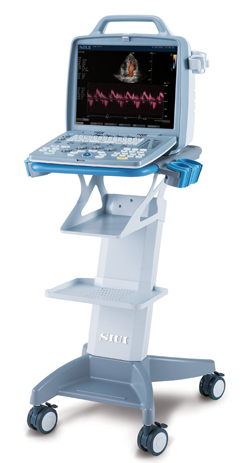 But if you want to increase the clarity of your images during guided injections and broaden the range of your diagnostic applications open to you, the new Apogee 1100 with Color Doppler, two exceptional probes, and large 12" LCD display is going to provide you with that next level of ultrasound imaging. What contributes most to the image quality on the Apogee 1100?